AIR connectivity for both international and domestic air services plays a critical role in the movement of passengers and cargo. Establishing more international flights for PNG can enable our connectivity with the outside world, however, our connections are limited. Statistical data on scheduled international passenger traffic to and from Port Moresby from 2012 to 2016 has been stagnant with about 480,000 passengers a year with an average of 55 per cent seat utilisation which means there was excess capacity in the market. This is according to Department of Transport secretary Roy Mumu who presented in session two on "Gaps and Challenges in Air Connectivity and the Role of Government" at the Southwest Pacific Dialogue’s second sub-regional workshop on connectivity development in Port Moresby last Thursday. In 2012, the total number of seats for international passengers was 800,181 while the total number of passengers were 467,158. Last year, the available number of seats was 941,212 but only 480,975 international passengers. 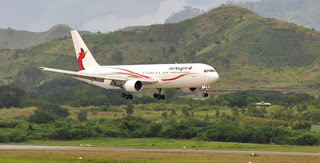 "It is considered that PNG has thin markets on its international routes. "As a result, we are advising that it doesn’t warrant introduction of a fully liberalised arrangement than open (market). "We’ve advised that it’s preferred to go for a phased approach so that we can grow the market and support our national airline to be able to compete in an open market. "We’ve noted and it’s evident that most of our bilateral partners have not taken up their traffic rights under the various air service arrangements," Mr Mumu said. The countries that PNG currently has bilateral ASAs with include Australia, New Zealand, Indonesia, Malaysia, Singapore, the Philippines, Hong Kong, China, Japan, Thailand, Federated States of Micronesia, Marshall Islands, Vanuatu, the Solomon Islands and Fiji. Meanwhile, the national airline Air Niugini currently operates in Cairns, Brisbane and Sydney in Australia, Manila, Hong Kong, Narita in Japan, Singapore, Denpassar (Bali), Honiara, Port Villa, Nadi in Fiji and Phonpei/Chuuk in FSM.